It’s the perfect thing to ask Santa for! I got my set 2 years ago for Christmas and I learned so much by using it. Such rich, vibrant colors! 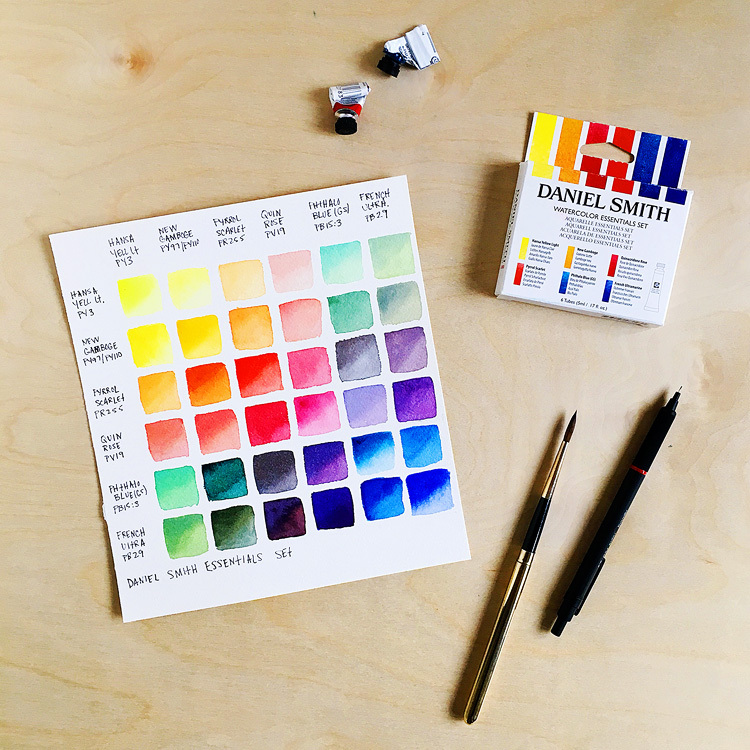 Here’s a color chart with just some of the possibilities of those 6 colors — of course by adding more water or paint you can get even more variations! The scan and the photos really don’t do these colors justice! You’ve gotta see them in real life. I used Arches cold press paper for my chart, and you can see the texture of the paper in the scan. I tried to paint each square so that it was darker at the top left and then faded as it went down, but that didn’t always work out hahah! Some colors have a mind of their own, like the pyrrol scarlet. But that’s okay, I love them anyhow. The colors on the diagonal are the pure colors, without being mixed with others. To paint each square I loaded up my brush with color, then dipped it in clean water, tapped a little of the water off and painted the whole square. Then I loaded my brush up again with pure color and dotted it in the top left corner and let it blend. The squares below the diagonal are done the same way, but with the 2 corresponding colors being mixed together first. I added more water to the mix on the squares above the diagonal. 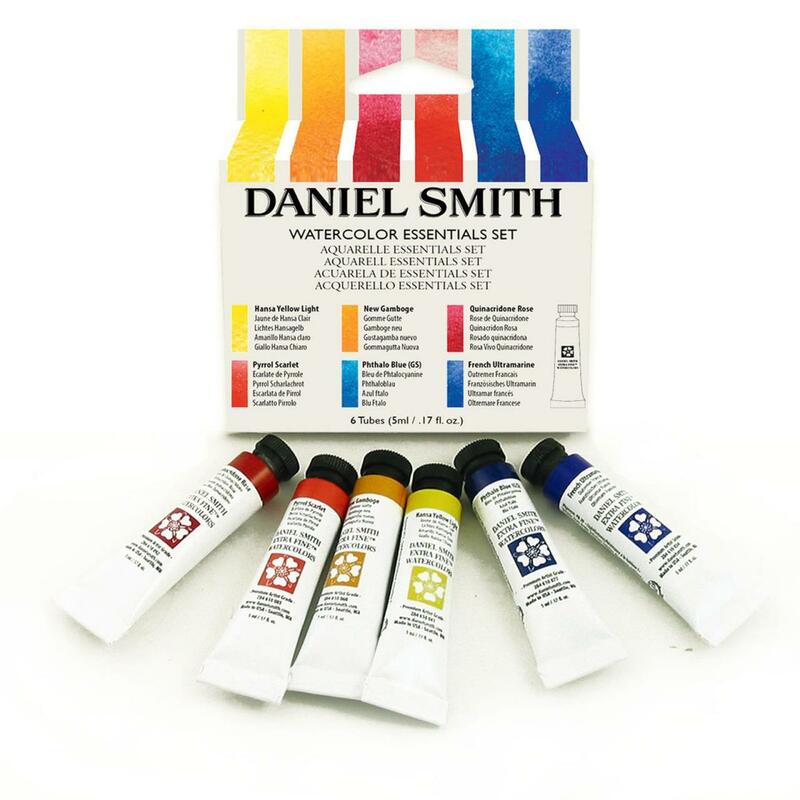 The set is made up of a warm and cool version of the 3 primary colors and comes in 5 ml tubes. You can squeeze the color out to a palette or just on a plate. Don’t worry if the colors dry — just wet them and they’ll reactivate like new. If you mix the warm cool versions of each primary together you’ll get a neutral primary. For example, phthalo blue + French ultramarine = true blue. Hansa Yellow Light (PY3): cool yellow, this is a very pale yellow, great for flowers, light shining through leaves, and lemons. I love the mint green that you get when mixing it with phthalo blue. New Gamboge (PY97 + PY110): warm yellow — another one that’s great for florals! I love the pine green you get by mixing it with phthalo blue. Look at that bright pumpkin orange you get by mixing it with pyrrol scarlet. Pyrrol Scarlet (PR255): warm red/orange — a little bit of this color goes a long way! Mixing it with either of the yellows makes for some pretty peach/blush tones. Quinacridone Rose (PV19): cool bluish red — the Daniel Smith version of this color is the bluest version I’ve ever used. The red that you get when mixing it with pyrrol scarlet is so vibrant. I haven’t found a red straight from a tube to compare. 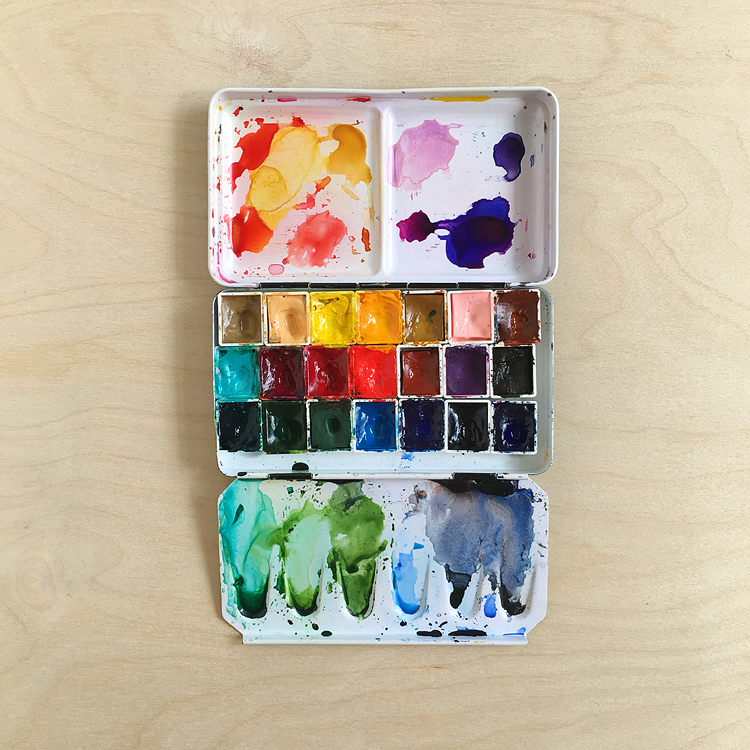 Phthalo blue (green shade) (PB15): cool blue — this is another one where a little goes a long way! Mixing it with the pyrrol scarlet will give you a super dark gray/black. Add more pyrrol scarlet for a deep rich brown. This is a very staining blue, but if you act fast you can still do the trick where you lift some with a tissue to make clouds. French Ultramarine (PB29): warm, granulating blue — this will add granulation to whatever color it’s mixed with! Mixing it with Quinacridone rose makes the prettiest purples. I also noticed that the PrimaTek set of 6 is also part of the Gratitude sale! If you like granulating colors, this is the set for you! 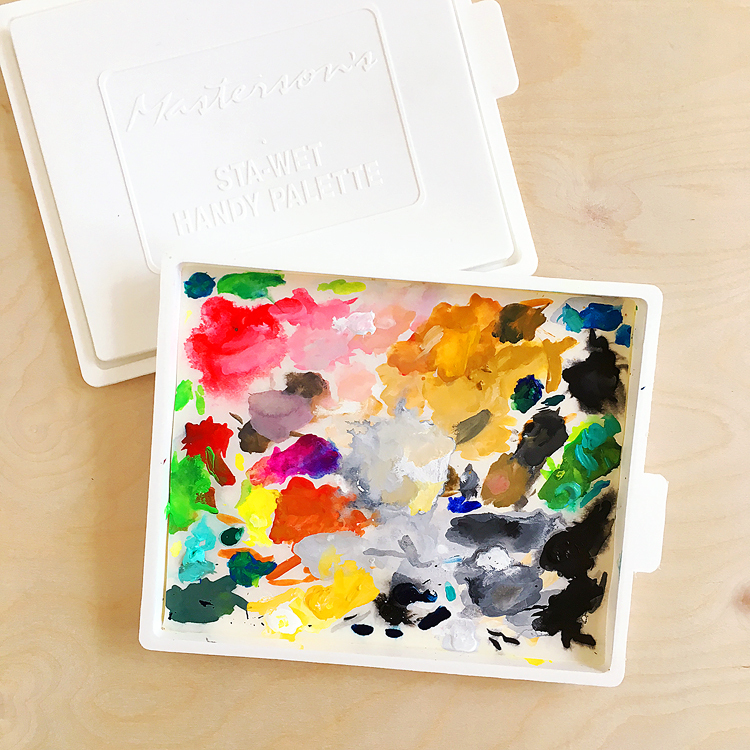 I think of granulating colors like jewelry or frosting — a little goes a long way. Note: These are my referral links, so I’ll receive a small commission if you make a purchase by clicking the link. Thank you so much for your support. 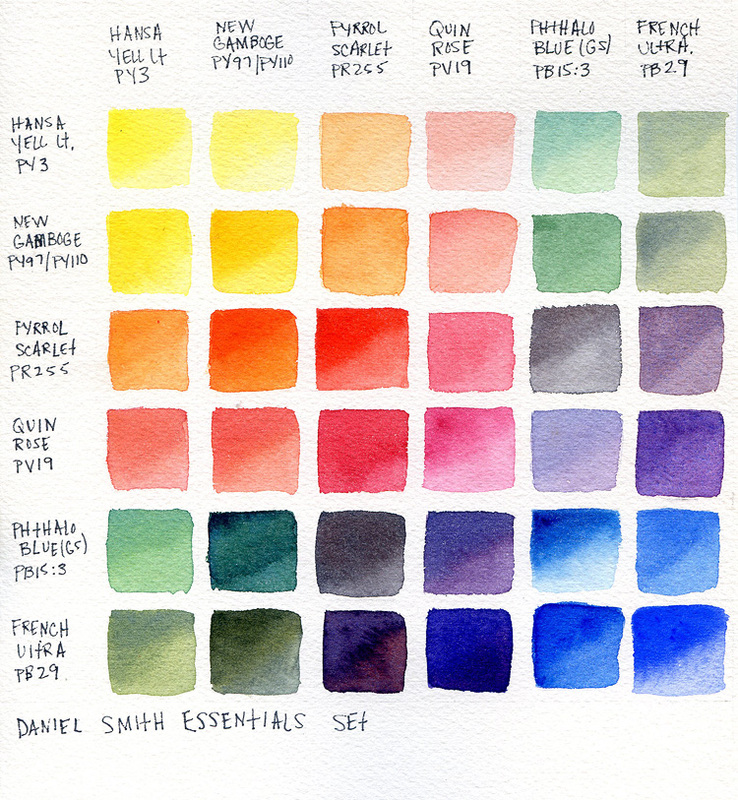 Here are some additional colors that I use all the time plus some notes about them with links to Ellen Hutson. Each color is listed in both sizes when possible. Quinacridone Coral 15ml | 5 ml — a beautiful warm red! I use it all the time for florals and sunrises/sunsets. Ultramarine Blue 15ml | 5 ml — Ultramarine blue is made out of the same pigment as French Ultramarine, but it’s less granulating and a little cooler in color, although it’s still a warm blue. I find it easier to use than the French version. Beautiful chart and reminder that we don’t need tons of colors to make tons of colors! Thank you. I’m a little confused (so what’s new) by: “The colors on the diagonal are the pure colors.” Aren’t the pure colors the top horizontal line of boxes and the left vertical line of boxes? Thanks for any clarification about the process. Oops – I mean the top horizontal line of color boxes – not the vertical line down. (Who’s on first!) Sorry about that. Hi Beth! I should draw a line on the chart to explain it better but I just couldn’t bear to lol! Anyhow, the diagonal line starting from the top left square has the pure colors — so where the names meet up with themselves. For example, pure quinacridone rose is the 4th square from the left and 4th down. French ultramarine is the 6th square over from the left and in the bottom row. Hope that makes sense! Thank you for explaining! This year I am trying to learn different techniques and info about watercoloring. I am totally new to this and of course, would love to see videos about everything as well!